Greentopia > Environment > Green Visions Shipping Container Floral Workshop! Now in its sixth year, the Green Visions program has installed an 800 square foot shipping container at the Green Visions Campus at 174 Whitney Street in the JOSANA neighborhood. The container has been completely retrofitted by Ikoniq, a Canandaigua-based company that creates top-of-the-line carts, kiosks, and containers for many of the country’s largest stadiums, concert halls, and amusement parks. The Green Visions’ container was designed to be used as a complete floral design workspace – with flower cooling room and tool room – and received financial support from the Allyn’s Creek Garden Club, the Rochester Garden Club, The John C. Wegman Foundation, Kathleen Holt and Steve Lurie, and the August Family Foundation. “The Green Visions shipping container is a huge step forward in helping to manage the program’s consistent flower bouquet production and delivery. 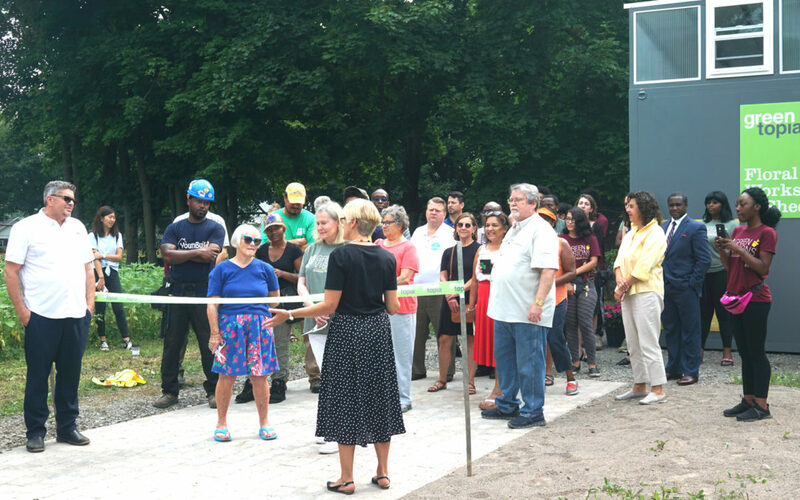 It is a first for the City of Rochester and serves as a model of alternative programming space for other grassroots neighborhood programs.” Says Lisa Baron, Board Chair of Greentopia. This project also serves as another example of the amazing collaboration found between Rochester organizations committed to the revitalization of the JOSANA neighborhood. This year, the Green Visions program is providing landscape maintenance for 19 Habitat for Humanity properties. In return, Habitat for Humanity and Rochester Youth Build provided the materials and installed a driveway for the shipping container. All of these neighborhood developments are guided by the vision and leadership of Charles Settlement House Neighborhood Association and its JOSANA Master Plan. For the last six years, the Green Visions program has been working not just in the neighborhood, but more importantly with the neighborhood.